The Sharing work package aims at implementing a peer-to-peer sharing middleware that manages all metadata transfers between various Hi-fi Systems and Authoring Applications. It provides users with mechanisms of messaging (chat), publishing and search on the peer-to-peer network, and manages the publishing rights of all shared items in order to allow only the sharing of user-owned data, i.e. metadata he (she) has produced on either application (title descriptors, playlists, Authoring application mix files, etc.). In order to control what types of data will shared, a set of different mechanisms is integrated: a W3C XML-signature based license mechanism, a content filter mechanism and a certificate and central web service based secure group mechanism. The prototype consists of several software components. The main components of the prototype are the Sharing Client (which can be used via a socket interface by SHF applications for P2P sharing, searching and messaging purposes), the Sharing Server (acts as a so called "rendezvous peer" and is used for the management of user groups). Other components are the Sharing License Generator and the Sharing License Validator. Additionally, there is the Trust Center (TC) Web Service (used for user registration and certificate generation). In order to demonstrate the use of the Sharing Client, a Demo Application with a GUI is also part of the prototype. 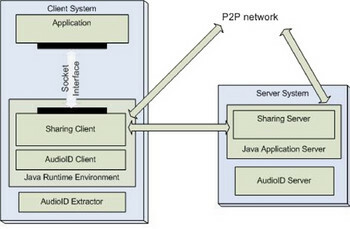 The AudioID server and client components provided by the Indexing work package are used for matching fingerprints and unique identifiers within the P2P sharing system.